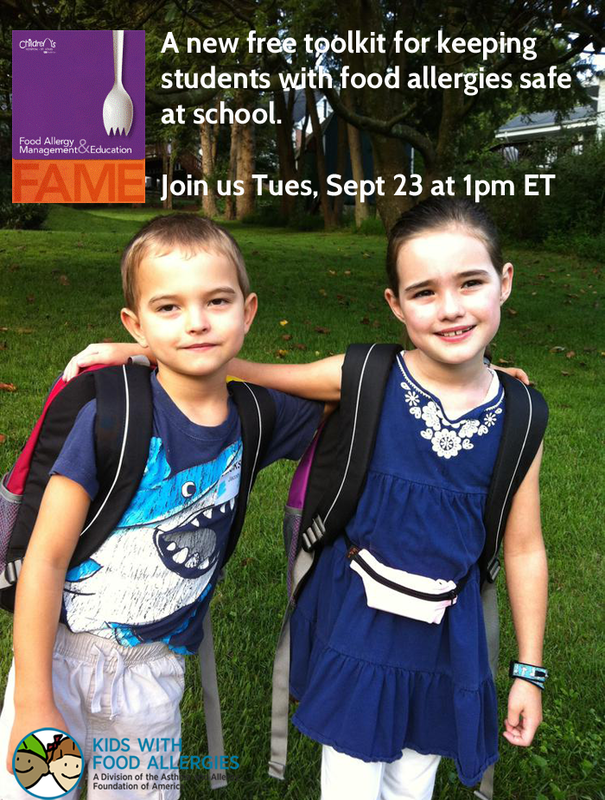 FREE WEBINAR: How Can the Food Allergy Management And Education (FAME) Toolkit Help Your Child and Your Child's School? The Food Allergy Management and Education (FAME) Manual and Tool-Kit is a wonderful new free resource that can be used by school nurses, teachers, administrators, parents and other school staff. St. Louis Children's Hospital developed it to assist schools and parents with the prevention of life-threatening food allergy reactions. Provide schools with the components of a comprehensive school-based food allergy program to promote best practices. Offer resources and materials to schools and families across the country on creating a safe, nurturing educational environment for children with food allergies. Increase awareness that children with asthma and food allergies have an increased risk of anaphylaxis which is a rapid, severe allergic reaction. Join Kathleen McDarby, RN, MPH from St. Louis Children’s Hospital, FAME Program Manager, and Dr. Michael Pistiner from AllergyHome and a member of the FAME Advisory Board, on September 23rd at 1:00 ET. They will walk through the FAME toolkit and show you how to use it to provide a safe nurturing school environment for children with food allergies. We're very pleased to continue to bring experts to you in a free format that is easily accessible. Space is limited, so be sure to register early. Register even if you are unable to attend - we will email you the archive a few days after the event. This webinar is made possible through a sponsorship by Mylan Specialty. Kathleen McDarby has a Bachelor of Science in Nursing and a Masters of Public Health from St. Louis University. Her career in health care expands 30 years, and includes working in community hospitals, ambulatory care, health insurance, health education and in clinical research for asthma and allergy medications. While with Blue Cross Blue Shield of Missouri, she developed, implemented and coordinating health improvement programs, such as the TakeCharge Asthma Disease Management Program and the TakeCharge Diabetes Disease Management Program. Both programs won national awards from the Blue Cross Blue Shield Association for Best Practice in Health Management. She is also active in the St. Louis Regional Asthma Consortium and is a past co-chair of the Board of Directors. In 2009 she was charged with the development of St. Louis Children’s Hospital Food Allergy Program. As program manager she established program goals and developed educational materials for schools as well as families that promote best practice in school-based food allergy management. One of the program goals is to keep children with food allergies safe within a nurturing academic environment. In spring of 2011 her team completed the FAME Manual and Tool-kit for all school personnel and families. In 2012 she led efforts to convene a National FAME Advisory Board made-up of individuals such as leading allergists, registered dietitians, school nurses, nutritionist and those who represent national organizations with expertise in allergies and anaphylaxis as well as parents. The FAME manual and tool-kit have recently been updated by incorporating the 2012 CDC national food allergy management guidelines, with recommendations from the FAME advisory board and includes the most up-to-date medical research. Kathleen is on the Board of Directors for the Asthma Allergy Foundation of America, St. Louis chapter. Michael Pistiner, MD, MMSc, is a pediatric allergist for Harvard Vanguard Medical Associates, as well as an instructor of pediatrics at Boston Children’s Hospital. He is the father of a child with food allergies. He serves serves in numerous voluntary leadership roles professionally and in the food allergy community. He is a member of the American Academy of Allergy Asthma & Immunology where he is a member of the Adverse Reaction to Food Committee. He is Co-chair of the Medical Advisory Team for Kids with Food Allergies, serves on the board of Asthma & Allergy Foundation of America, New England Chapter, as well as the national AAFA organization. Dr. Pistiner is the author of Everyday Cool with Food Allergies, and is co-creator of AllergyHome.org, a website that provides free modules designed to increase food allergy awareness in the community.